This guide contains homemade facial recipes. You don't have to spend a lot of money at a spa to enjoy a facial. Here are a number of different facial recipes for various skin types and needs. A Day at Your Favorite Spa: Your Own! Most of us really need a day at the spa pampering ourselves. The everyday stresses that everyone feels can really get us down. But who can afford to spend that kind of money in this economy? So in this article, I propose to offer some suggestions on reducing stress in your life without the heavy price tag. Why does a day at the spa cost so much? Most of what you are paying for is the designer products that they use. Did you know you can make your own spa products at home? Also, you are paying for the atmosphere which you can recreate right at home. Candlelight is soothing to the nerves and a soothing tape can take you far away in your dreams. 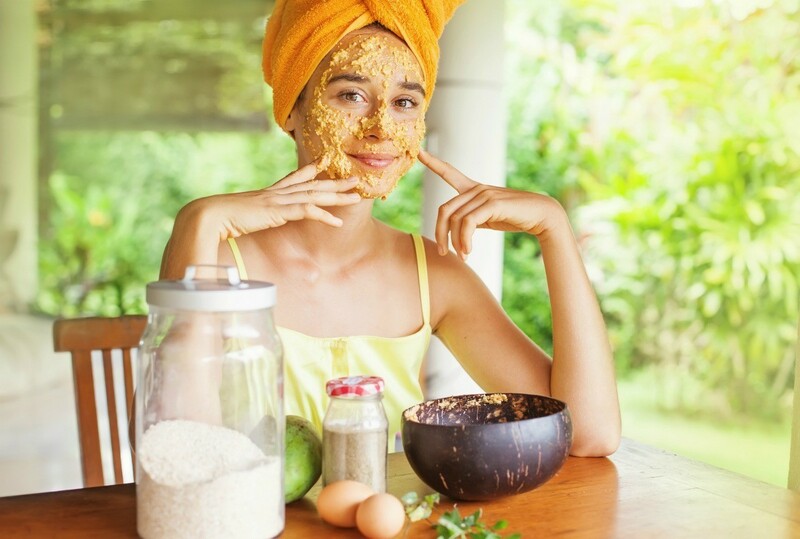 Facials are another place that spas charge the big bucks but with a few of my "fresh recipes" and a good friend to help you to apply, you can have a spa facial at a fraction of the cost. The first step to a great facial is to clean the skin well. You don't need expensive cleansers for this just a short trip to your local grocery store and you have all the ingredients for a natural skin cleanser. Mix all ingredients together and place in a sealed container. Store in the refrigerator. Use 1 tsp. morning and night to cleanse face. The next step is to steam the face. Pour hot boiling water into a bowl and tent your head over the bowl. Dry herbs like peppermint or lavender can be added to the bowl for the rejuvenating properties (peppermint) or calming effect (lavender). Your next step is a face mask. Again, no need for expensive products, just a trip to the local grocery. In a bowl mix smashed avocado with the honey, then continuously add oatmeal. When all ingredients are mixed well apply to face and relax. After 10-15 minutes,wash off with warm water. Do this once a week or when you desire relaxation. You won't believe the difference! This mask will peel off your blackheads and tighten your skin. It is very strong, so those with sensitive skin may want to rinse this off instead of peeling it off. Do not use if you have acne. In a small pan mix the unflavored gelatin and the cold milk. Stir until melted over a very low flame. Once melted, remove from heat and let the gelatin mixture cool slightly. Then add one egg white. Mix until smooth, and when cool enough to touch, apply evenly over face. Do not apply on, or directly under, your eyes or on your upper lip. Apply quickly before mixture hardens in pan. Apply enough to cover your skin but not too thickly. Lie on the couch and let it dry completely, about 30 minutes. Once dry, lift up a corner under your chin and peel off lightly in an upward motion. This will really tingle. 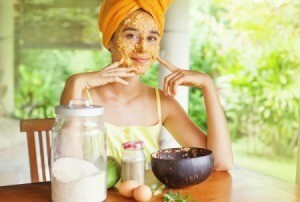 Rinse face with lukewarm water and apply vitamin E.
Tip: The vitamin E is for moisture. If you prefer, you can use your favorite moisturizer on your face instead. This mask sounds and looks disgusting but is very soothing and good for a face tormented by sore underground pimples. Pour 1/2 cup boiling water over 2 dried prunes in a bowl and leave until soft. Mash prunes. Use any leftover prune water in cooking about 1/2 cup oatmeal. Mix oatmeal with mashed prunes and enough honey to make a sticky mash that will adhere to the face. Apply while still warm (but not hot), leave 20 minutes and rinse off with warm water. Your last step is to apply a toner to your face. Then you will have a clean palette to apply your special makeup. Here are some great recipes for them. Mix water and vinegar. Pour into a clean decanter and store in bathroom. Use daily after washing face by putting on a clean cotton ball or gauze and wiping face. BE CAREFUL NOT TO GET INTO EYES! Combine ingredients in a small saucepan. Boil for 10 minutes, then remove from heat and allow to steep for 5 minutes. Strain liquid into a jar, cover and refrigerate. Will keep 2 weeks refrigerated. Apply with cotton balls to skin. Especially good for very oily skin.